One of the most popular cricketers in Indian cricketing history, Tendulkar is also referred as ‘The God of Cricket’ in India. 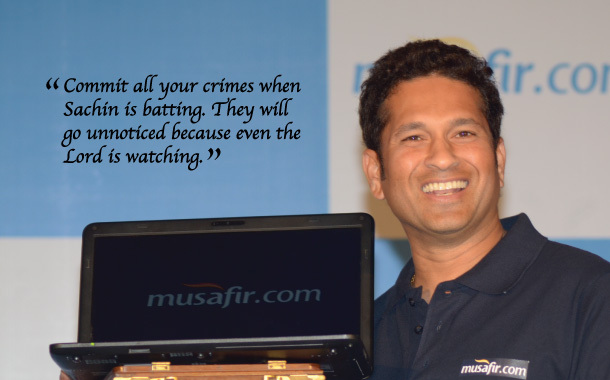 From the cricket in 90’s to the recent format of T20, I have seen Sachin play gracefully throughout the metamorphosis. Cricket got commercialised and glamourized but the excitement of watching the ‘Master Blaster’ smash one ball after other never subsided. Glued to our television sets with whole lot of anxiousness, I watched him hit scores one after the other. Such were the days back in time when Tendulkar single-handedly won matches for Team India. Mark Taylor, the captain of Australian Cricket Team in 1998 said, “We did not lose to a team called India...we lost to a man called Sachin.”, when his team lost the Chennai test as Tendulkar scored 155 unbeaten runs in the second innings. Tendulkar has been knocked-out 18 times between the score of 90 and 99. Imagine, how many more feathers he would have had in his cap? As a tribute to this Little Master, here is my pick of the most iconic and memorable centuries scored by Sachin in a career spanning 24 years. Little Sachin made his debut when he was barely 16 years old. In less than a year, the 17-year old Tendulkar stunned the entire cricket kingdom with this feat. This was the very first century of his stupendous career - 119* not out! After 78 matches, the wait was finally over Tendulkar. In Sri Lanka, he hit his first international century in an ODI (One Day International). He also won the ‘Man of the Match’ in that particular match of Singer World Series. He scored 110 runs and led India to victory. Tendulkar scored 30 centuries on grounds away from India, out of which 7 were scored at Sharjah Cricket Association Stadium in UAE. This was one such incredible innings by Tendulkar in the 4th match of Pepsi Sharjah Cup. In the sands of Sharjah, when India had lost all hopes, a Desert Storm emerged from the pavilion and wrecked the entire Australian cricket team’s bowling line-up. An inning stormed with 5 sixes and 9 fours led India to a staggering victory qualifying India for the finals. It was the 1999 World Cup and the sudden news of Tendulkar’s dad passing away had stirred in a lot of emotions. Tendulkar had expressed his will of not going back to play the match. But, after his mother insisted that he played and makes his father proud, he did play. His father would have always wanted him to play and that made him strong. Three days after the sad event, he scored 140* (not out) and raised the bat in the air to pay homage to his father. After receiving the ‘Man of the Match’ award he said, “This one’s for you, dad”, in his winning speech. Tendulkar scored his career’s highest in a test match that lasted for 4 days with India’s victory. Although he did not hit any sixes, his innings comprised of 35 fours. When we talk about Tendulkar’s iconic centuries, you cannot miss this century. Tendulkar hit 19 fours and 4 sixes and scored 175. With a little help from Suresh Raina, India managed to score 347 runs. Hitting the target of 351 runs was a near miss! Just when the media was talking about Tendulkar losing his form and speculating his retirement plans, he sloshed 200 runs taking India to victory. Tendulkar also won the title of ‘Man of the Match’ for achieving something that was always considered impossible. Tendulkar is truly a world-class player. This century of his in the India Premier League just proved to be truly at par with excellence. He has hit centuries in all the formats of the cricket in his time. In 2012, he played against Bangladesh scoring 114, becoming the only cricketer to score 100 100s in international cricket. Although, India failed to win the match, Tendulkar created a world record. Talk about treating yourself with the best birthday gift- Man of the Match, Man of the Series and Coca-Cola Cup! Yes, when most of us are dealing with a ‘quarter of a life crisis’, Tendulkar played a chic innings consisting of 12 fours and 3 sixes on his 25th birthday. Tendulkar also hit the fastest 50 and the most number of 6s in the tournament.